It’s been more than 20 years since I regularly wore a watch. For the first 10 years, it was because I found that I never really needed to look at one—there was a clock built in to the dashboard of my car; at home, clocks (and appliances with built-in clocks) were never more than 10 feet away; I had clocks in my garage and in my backyard; at work, there was a clock on my computer, and if I was away from my office at a meeting, there were clocks in most of the conference rooms. Then when cell phones came along about 10 years ago, I suddenly had a “watch” of sorts again. It wasn’t a bulky piece of metal strapped to my wrist, but I became reliant on it. I had opted not to take a cell phone with me on my trip to Botswana earlier this year because of the supposedly spotty reception in the Tuli Wilderness, where I would be staying for two weeks. But even more than that, I really just wanted to get away from all of that. I wanted a vacation form technology. I soon realized that not having a cell phone with me while traveling would not only deny me of communications, but it would also deprive me of any way of accurately and consistently telling time. I had flights to catch, people to meet, places to go, and a 10-hour time difference to deal with on top of all that. So I did the unthinkable. I went out and bought a watch. Ironically, my quest to go technology free, or at least as “technology light” as possible, was quickly backfiring. And it wasn’t just with the watch. I usually charge my camera batteries by hooking the cameras directly to my computer through a USB cable. But not taking a laptop with me, I would have to take three separate battery chargers with me. And since my chargers all worked on standard 110 volt US current, I needed a 220 volt power converter, as well as the appropriate adapter for South Africa and Botswana. It just kept getting more complicated. One of the attractions of heading off to the wilds of the Tuli Wilderness for an extended time was to get “off the grid”, so to speak—and what better place to do that than at Mohave Camp, a remote, technology-challenged outpost where you were not even allowed to shower in the open bathrooms after dark because the elephants would come right up and snap off the shower heads looking for water; a place where laptop and camera batteries had to be charged for just an hour or two every night by running a power inverter off of the battery in the Land Rover. When Mohave Camp was taken out of commission by the floods and we instead rolled into Serolo Camp, my decadent half loved the idea of staying at a “luxury” camp for the duration of my visit and taking advantage of plush creature comforts such as electricity and hot showers. But my primitive half, the half that loves sleeping in the dirt and redefining what “personal hygiene” means, was more than a little upset that I was missing out on my chance to truly go off the grid. But that was OK. I could live with it. The technology dichotomy in modern, rural Africa was quite interesting. I imagined I was going to a place where the sun is the power grid, the local stream is the water line, and talking around the campfire is the equivalent of the cell phone or social networking. Boy, was I wrong. Over the course of my stay there, I saw many things. Although I opted not to take my cell phone with me to southern Africa, I saw at least as much reliance on cell phones while there as you would see on a typical college campus back in the US. Everyone had cell phones—and everyone used them. Constantly. When driving across the Tuli Wilderness at night, besides the light on the vehicle and the stars in the sky, there was only one other light visible: a red light several miles south of the Limpopo River, inside South Africa, that marked the closest cell phone tower. Except for a few spots, it was usually fairly easy to get a cell phone signal in the Tuli. There were two-way radios in each of the vehicles at Tuli, and they were used frequently for both day-to-day and emergency communication, but sometimes cell phones were more reliable. If your vehicle broke down and you radioed for help and nobody answered, you then called that person’s cell phone—because you knew that they always answered their cell phone. One night there were eight of us sitting around the campfire at Serolo Camp, and I was deep in conversation with another person. As our conversation slowed, I noticed we had been the only two talking and glanced over towards the others. All six of them were sitting with their faces down in their cell phones, frantically texting. I can only hope they were not texting each other. Let’s face it, technology—and our reliance upon it—isn’t necessarily a bad thing. It’s easy to see the rampant destruction of the natural earth and blame modern technology, but that same technology also has a number of positive aspects. Even though there was no Internet connection in the Tuli Wilderness, there was a laptop. And we used it daily. The goal of the Botswana Conservation and Research Project, after all, was data collection; what we did, every day, was to drive around the Tuli Wilderness and log data manually onto paper forms held on clip boards. But every evening the data we had collected on various animals throughout the day had to be entered into the computer so that it could be shared with researchers around the world and thus contribute to the advancement of conservation science. Another good example of the positive side of technology was creative use of an iPod by Andrew, who ran the conservation volunteer program. He had it loaded with guidebooks detailing the bird, mammal, and even fish species found throughout southern Africa. He would identify a bird from a distance, for example, and then bring up that species on his iPod, show us detailed drawings and photographs of the species, and even play us an audio file of the birds call. Leveraging the latest technology took the idea of a printed guidebook to an entirely new level of utility and interactivity. Good or bad, technology was everywhere in Africa. I had gone into this trip thinking I was going to be almost completely off the grid and technology-free for a few weeks. One night in camp as we were enjoying a very quiet dinner of mincemeat, mashed potatoes, and a fresh salad by candlelight, I heard a familiar sound that at first I paid no attention to. It took a second or two before I realized that it was a sound I shouldn’t be hearing out here in the remote wilds of Botswana. Then Laura pulled her ringing cell phone out of her pocket and answered it. Technology. Sometimes we are master, and sometimes, it seems, we are slave. 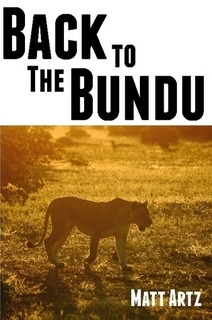 This story is excerpted from Matt Artz’s book Back to the Bundu [ Paperback | Kindle | NOOK | iPad ].